This page gathers important information and updates for the Stage Alliance Inc. bargaining unit workers. This is ALL current Stage Alliance Inc. non-manager/staff employees. All Stage Alliance employees should read the articles below, watch for any email updates coming from <*protected email*>, and check this page for future updates. Welcome! As a Stage Alliance employee, you are part of the Stage Alliance “bargaining unit” and are represented by IATSE Local 205. Read on for an explanation of what this means, how it affects you. IATSE Local 205 is the local chapter of the International Alliance of Theatrical Stage Employees (sometimes known as the IA), the union that represents those working in the entertainment industry. Please visit iatse.net to become acquainted with the scope, reach and goals of the IATSE. Local 205 represents stage employees working in live entertainment in Austin, namely theater, exhibition trade shows, conventions, and concerts. Our members are stagehands just like you and, just like you, we are concerned about the standards in our industry. As union members, we have ability to collectively negotiate our Agreements, such as the Stage Alliance contract you are currently working under. We believe coming together in union gives us more power to control our wages and working conditions. You can visit iatse205.org to learn more about us. Local 205 has a Collective Bargaining Agreement (contract) with Stage Alliance that determines our wages, benefits, call minimums, breaks, worker safety, progressive discipline and termination policy, and so on. This Agreement is negotiated by Local 205 and enforced by the Local 205 Business Agent and/or the Union Steward on every Stage Alliance call. Everything negotiated into the Agreement, such as progressive discipline and termination policy, health and retirement benefits, apply to all Stage Alliance employees, not just union members. The SA Rep represents Stage Alliance’s interests. Their job is to foster good relations and enforce the contracts between Stage Alliance and its clients, namely the venue or company they are providing labor for. The SA Rep is management’s representative, not your representative. The Union Steward is your representative. The Steward is not the “SA Rep” (even though sometimes the same individual is assigned as the SA Rep on one call and then as the Steward on another). The Union Steward’s job is to protect you and your rights, and police the Agreement between Local 205 and Stage Alliance. The Union Steward is the legal equal to management’s representatives. If you have any questions about your rights, your Steward is the person to talk to. If you ever feel that you are being told to do something that is unsafe or get injured on a call, immediately consult with your Steward. Your Steward can also answer contract, benefits or union membership questions. Because you are working for Stage Alliance under a union Agreement, you have rights that don’t apply to non-union work. Some of those rights include progressive discipline, grievance procedures, and Weingarten Rights. For example, if you feel you have been unfairly treated by Stage Alliance, you should immediately bring your complaint to the attention of your Union Steward. If your complaint has merit, your Steward will file a grievance on your behalf and the union will pursue the grievance procedure until the grievance is resolved. Also, if you are asked to attend a meeting with Stage Alliance management, and you believe the meeting may lead to disciplinary action, you can insist that a union representative accompany you. These are your Weingarten Rights, one of the most important ways that the union protects you from unfair or unwarranted discipline. Again, it is important to note that none of these advantages are available to you without a union Agreement in place, because employers do not give these conditions freely. These advantages are negotiated through the collective strength of a unified group, which is much stronger than the negotiating power of an individual. Union representation and all of the conditions negotiated into the Stage Alliance Agreement apply to all Stage Alliance employees, not just union members. This includes the health and annuity benefits, which are financed by contributions paid for by your employer. Benefit contributions do not come out of your wages, they are in addition to your wages. Once you have received enough employer contributions to qualify for health insurance, you will receive a packet from the IATSE National Benefits Fund. It is an insurance enrollment packet, not a solicitation to join the union. Please get in touch with your Union Steward for more information about how to access your benefits, or go to the National Benefits Fund website to create an online account to begin taking advantage of your benefits, www.iatsenbf.org. In exchange for the many benefits Local 205 offers, we ask everyone to make a small contribution to help cover our operating costs. We ask that for every dollar you earn under your union Agreement, you donate a nickel to the Local (or 5% of your gross income). The money collected ensures we can represent everyone to the fullest extent. Without this income, we would not have the funds necessary to take a dispute all the way to arbitration. In 2016, we took a wage dispute to arbitration and won. Details can be found here. To contribute 5% to Local 205, you must sign a work assessment check off form and turn it in to the Steward. You can print one here or ask your Union Steward for one. You only have to fill out one form for all Stage Alliance work, not one for each call. Remember, we ask everyone to contribute their fair share because everyone benefits. What is Fair Share? Watch this video: https://youtu.be/M5JMGx9FXxA . If you would like to consider union membership, ask your Union Steward for information about joining Local 205 or email us at gro.5155571543802est1555715438ai@pi1555715438hsreb1555715438mem1555715438. 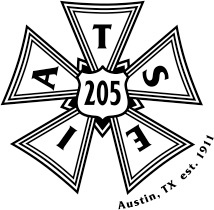 It is always exciting when Austin stagehands consider union membership with Local 205 because growth = strength. The stronger we are as an organization, the more power we have to make positive changes for everyone working in our industry.